We are an innovative software company located in North Berlin, directly at the Waidmannslust S-Bahn city train station. We develop modern software development tools and customer-specific application solutions. Our customers come from the area of public administration (state and federal authorities), large companies and renowned scientific institutions, and the health care sector. If you join us, you can expect to find interesting work in an open company culture. Your work will be characterized by short decision-making processes, plenty of opportunities for individual creativity, and flat hierarchies. You'll find that we provide the best possible environment for promoting your personal and professional development. You will work in a very good working atmosphere with an open company culture and flat hierarchies. You will take part in interesting projects, work in open and friendly teams, and use the latest technologies. You can opt for flexible working hours, work part-time or choose other special working-hour options. We are easily accessible by public transport (direct S-Bahn city train connection) and by car. Ample parking is available. After a period of training and settling in, home working may be possible, though on a limited scale. We particularly welcome applications from women and, if required, can offer suitably flexible, family-friendly workplace and working arrangements. "Right from day one, I've enjoyed going to work! 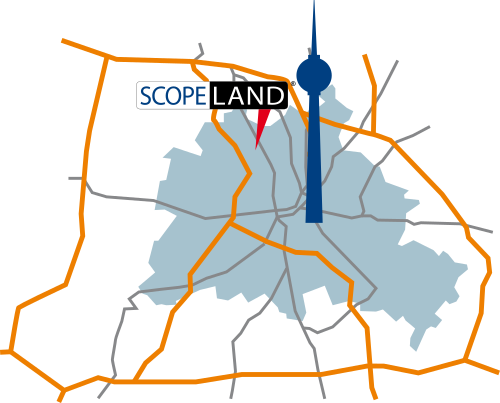 Everything is just right at Scopeland: nice colleagues, a relaxed atmosphere, and exciting projects!" "As a product developer at Scopeland, I'm faced with a variety of new challenges every day." "What makes working at Scopeland so interesting? It's the new challenges that each project brings. From aviation, clinical research through to finances, in intelligent teams and with flat hierarchies." "I feel completely at ease at Scopeland. Whether I'm in the office or out and about for our customers, my job as an application developer is never boring!"